Ponies On Parade Leaders Show Shirt. 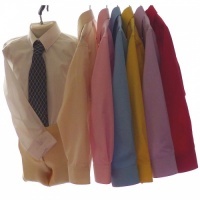 Material 65% polyester 35% cotton gives these quality Leaders shirts that crisp look wash after wash. 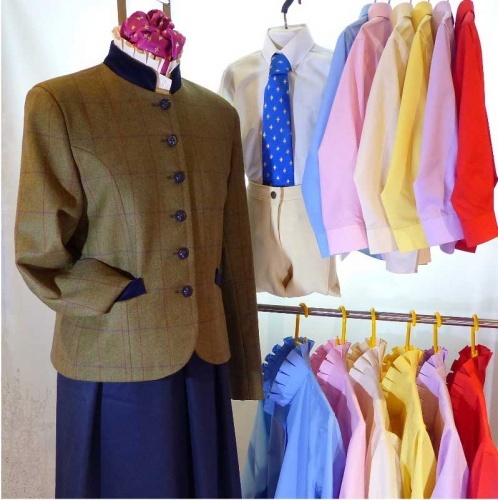 The box pleat collar and optional short sleeve or pleated cuffs (£5.00 extra) have a slightly stiffened inner so they keep their shape well. Size ranges from 34" to 46" chest. Colours; White, Light Blue, Pink, Ivory, Canary, Lilac and Red. Diamante buttons as standard. Special order item, so please ensure you allow time for these to be made when ordering and if you have a specific show or date you require it enter in the box provided and we will ensure we can meet it for you. Sizing: These are generous fitting, to select the best fit simply put a tape round the largest part of the chest. Then decide if your shape is a wide back or larger bust. If you consider you have a wide back you may be better with the size smaller than your measurement, if on the other hand you are full fronted then order according to your measurement.